SEARSBURG – Activists opposing industrial wind turbines from all over Vermont greeted Gov. Peter Shumlin on Monday, some with rude signs and gestures, as Avangrid Renewables held a ceremonial groundbreaking for its 20-megawatt Deerfield Wind project. Susan Smallheer / Staff photo – Steven E. Wright of Craftsbury Common was one of about two dozen anti-wind demonstrators who greeted Gov. Peter Shumlin Monday in Searsburg at the official groundbreaking of the state’s latest commercial wind project. Deerfield Wind will be the first commercial wind project built in a national forest, next to the state’s first commercial wind project, Searsburg, built in 1998. Fog and rain obscured the two ridgelines where the 500-foot-tall turbines will be built, as well as the already existing 200-foot-tall Searsburg turbines, which are owned by Green Mountain Power. The two dozen protesters, holding signs criticizing Shumlin for his close ties with the wind industry, complained that the state’s ridgelines should not be sacrificed for renewable energy tax credits sold to out-of-state utilities to meet their green portfolio requirements. Avangrid, which is a newly formed subsidiary of energy giant Iberdrola Renewables, plans to erect 15 turbines on ridgelines in Searsburg and Readsboro, with half the project in the Green Mountain National Forest. The $80 million project will produce 20 megawatts of power. “This is really a big deal,” said Shumlin, leading the group in the ceremonial dirt toss. According to the demonstrators, Shumlin gave as good as he got when it came to rude gestures, as his state SUV was driven into the scene. Demonstrators Jon Brabant and Stephanie Kaplan, both former state employees with the Agency of Natural Resources, said they were showing their middle finger to Shumlin as he arrived, and he responded in kind. Later, as Shumlin was driven away, three Vermont State Police troopers forcefully shoved the protesters who were in the road out of the way. No one was arrested or hurt. The demonstrators, who came from as far away as Swanton and Greensboro, were kept away from the ceremony, which was held on private property, but only a short distance from the border of the Green Mountain National Forest and farther to the west, the George D. Aiken National Wilderness. Shumlin told the Avangrid gathering that wind energy was an important step toward getting the state off coal and oil, and reducing the state’s carbon footprint. Since he took office, he said, the amount of solar power generated had increased by 11 times, and 22 times for wind power. Shumlin recalled several instances how the Vermont climate was changing, and not, to his mind, for the better. He said he wanted to save bears – including polar bears, which he said were drowning because of climate change destroying the ice they depend on. And, he said, bats were dying from climate change as well. He blamed white-nose syndrome, which has killed millions of bats in the Northeast, on climate change as well. The project was held up for 12 years by a lengthy review prompted by the fact that half of the project will be in the Green Mountain National Forest, a first for the national forest. John Sinclair, the forest supervisor, said the Rutland-based national forest office would be keeping a close eye on the construction project. He said Vermont was still conducting a study about the impact on bears from the project since the Forest Service was the primary lands manager. “Our focus is more on habitat,” he said. Conspicuously absent from the celebration, held in foggy and rainy conditions, was the Vermont Fish & Wildlife Department, which had fought the project, saying it would destroy prime black bear habitat. A small contingent from the Green Mountain National Forest attended the ceremony, but did not speak. 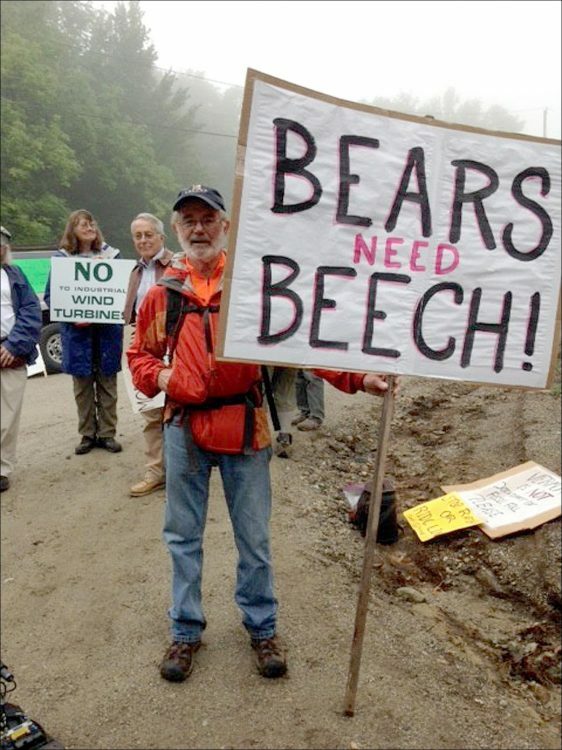 Many of the demonstrators’ signs referred to the destruction of bear habitat – large stands of high-elevation beech trees, a key source of food for the bears. Steven Wright of Craftsbury Common, a former commissioner of the Department of Fish & Wildlife, said wind projects were inefficient and expensive, and did little to reduce the state’s dependency on fossil fuels. He said the state’s Public Service Department and Public Service Board needed to be “reformed” to give towns more of a say on energy projects. He was joined by David Kelley of Greensboro, a Republican who ran for governor in the 1990s. He said Shumlin was in bed with the wind industry, and wind company owner David Blittersdorf had made more than $400,000 in donations to Shumlin campaigns over the years. Kelley, who was a longtime attorney for the Vermont Ski Areas Association, said if the state’s ski areas had caused as much erosion as the wind projects in the Northeast Kingdom, they would have been shut down. “Put these guys through Act 250,” Kelley said. Power from the turbines will be purchased by Green Mountain Power, which has already signed a contract with Avangrid, a subsidiary of Iberdrola Renewables, an energy giant headquartered in Spain. Also kept away from the ceremony was Rep. Marianna Gamache, R-Swanton, a member of the House Natural Resources and Energy Committee, who was not on the guest list. Gamache, who is opposed to commercial wind development, said she was told attendance was limited to invited guests and the media, and people had to go through a checklist to gain entry up a short dirt road. She criticized keeping the public from the groundbreaking, especially since half the project is being built on public land. Shumlin, joined by Readsboro Town Administrator Rebecca Stone, and a couple of Avangrid officials and executives from the construction companies that will build the project, pushed new shovels into a pile of sand, and tossed it into the air.